It’s early Saturday morning, and with only one client to see en route (sort of) to a shopping trip in Santa Fe, it actually feels like a day off work. Perhaps because I have no intention of opening up my work computer? I am significantly aware that I have not participated in any of the several opportunities to sit with others in contemplation, as I was accustomed to do before January 1st. Engaging in moving meditation has taken on a whole new meaning – no longer a structured, slowly measured walk but rather brief minutes of focused consciousness while driving from one place to another. I am trying to also achieve moments of stillness and non-thought before starting each new task of the day, and especially before opening the work computer. It does seem that the better I am centered, the more smoothly the computer operates. May I hope, in time, to feel the same connection to that computer as I do to my VW? I’ve scheduled the car for a visit to a local mechanic, ostensibly for a check over before I take a long drive to Sedona in mid-May, but actually because something about the way the car starts in the morning has alerted me that all is not well with my trusted steed. Will I ever reach the point of being able to tell, before opening the first screen of my job-dedicated computer, that one of its many layers of security interface is experiencing a glitch and that my work session will not go well? Have you noticed how pervasive is the tendency to think one is doing something wrong, if a project encounters obstacles? We seem to expect that once we’ve planned a course of action, and put it into motion, all should go easily. Problems that crop up are taken as criticism of our planning, or perhaps of our intentions. How unrealistic, and egocentric a view that is! Some of us who meet such obstacles simply drop the project, believing we are not meant to succeed. Others try to force their will upon the perpetrators of the obstacle, bulling their way to the desired goal. Neither process is enjoyable, neither brings much sense of achievement. One of my teachers of MasterPath spoke of going for an outing on horseback, following a trickling water course up toward the mountains. 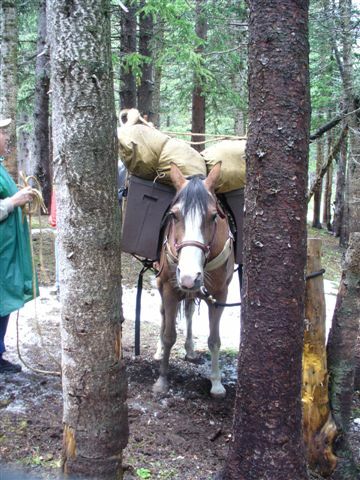 She had to ride around large boulders, zigzagging from side to side of the stream and occasionally pushing her horse to scramble up onto one bank or the other to get around a fallen tree. Life is like that, she said – a path toward a distant goal but never smooth and straight. More than half way to the mountain, a thunderstorm erupted near the mountain top and wise woman that she is, she immediately pushed her horse up out of the arroyo and onto higher ground, heading back toward home at a brisk trot. Going to the mountains would be the project for another day. We need to be flexible, she said, and recognize when it is – and when it is not yet – time to undertake or complete projects. When it is right to push forward and when it is wise to step aside and wait. A true measure of success is not, then, about achieving goals in one’s predetermined time frame, Rather, it is about how one behaves, feels, enjoys the process of moving toward the goal and how flexibly one adapts to the inevitable obstacles and delays that are encountered. I’m not revealing anything new here. Only reminding myself of my best course of action in managing my demanding new schedule so as not to reach the point where I must, like my co-worker, resign in order to survive. My choices are to increase my awareness of “the flow” so as to be better able to go with it; improve my patience so as to be better able to accept God’s timetable instead of my own; and enlarge the scope of my adaptability so as to be best able to “enjoy the process rather than focus on the outcome.” Oh, and definitely to have fun along the way! It’s the end of a long, productive but tiring day and I had no idea what to write about for this week’s post. I opened email from a dear friend, to find a single word – “rain”. Perhaps because my last email to him announced happily that it was raining outside? For all of five minutes, it actually did rain, hard enough to be heard from inside the house. Rain – its long absence from our lives, the urgent need for it – is on many minds. An elderly client stated that damp weather – like cold – makes her bones ache but she’d welcome the ache if it brought water for our thirsty earth. Driving into town (I live about 15 miles out) earlier this evening, I remarked on the dusty, silted, sadly brown fields and talked about the Depression Era dust bowl with my companion. In that area of our community, on a windy day, the air is almost unbreathable, thick with topsoil being scoured from the land. Ninety plus years along, and it seems we haven’t made any progress at all toward preventing another dust bowl. Hmm… the saying is that you attract what you give your attention to. Perhaps the problem is that too many of us have been giving attention to the drought, when what we should be doing is meditating on rain, snow, lakes, springs, moisture in all its myriad and lively forms. Like the pond I discovered beside the road back into the mountains, en route to do an assessment with a client who lives in a tiny camper trailer on a twelve acre parcel of wooded mountain land. Several ducks floated on its surface, undisturbed by a chorus of frogs loud enough to be heard over my car’s engine. More than twenty years of living not far away from the area, and I’d never heard that the pond existed. My client informed me that it’s not a year around water, that by June it will be dry. So think about rain. Think about all the different types of rain I’ve experienced. The first that comes to mind is in Saigon. My usual form of transport was a cyclo-pousse (French for the combination of bicycle and push, describing a bike with a seat in front, sitting on two wheels). 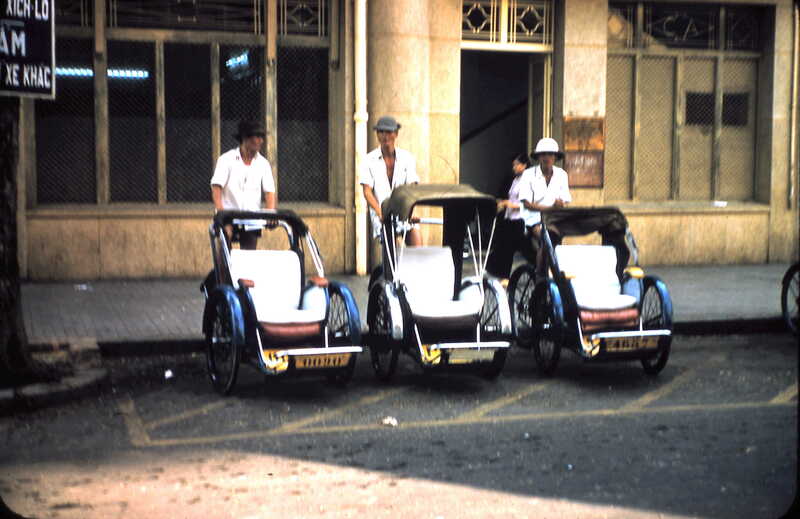 The faster, noisier variety were called cyclomoto, did not have a carriage cover, and so could not enclose the rider. They were better adapted to carrying large loads. 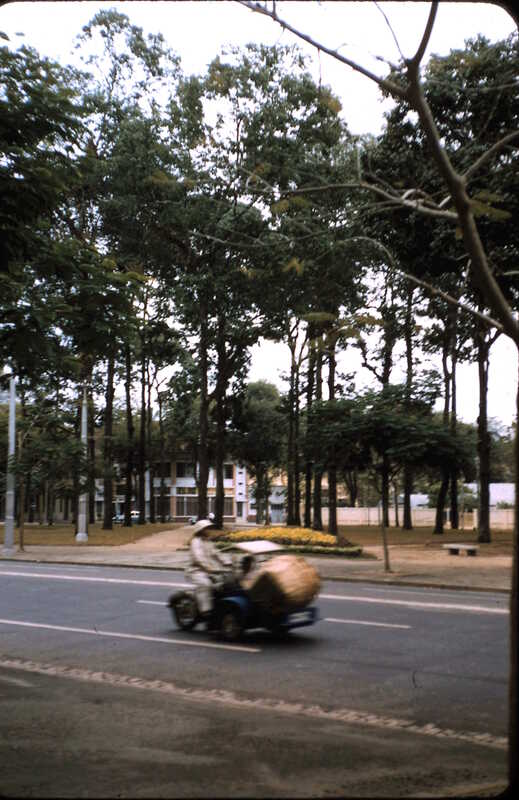 During the rainy season, the cyclo driver would deploy, from behind the seat, a sort of umbrella cover to which tarps could be attached, ostensibly to keep the rider dry. You can see the cover, minus its surrounding tarp, on the central cyclo. Being enclosed did help a bit, but one still got soaked from below, as furiously fast rains pounded the pavement and rebounded up to a height of two feet or more. There was really no way to be dry if one went outdoors during the downpour. Fortunately, the rains came on a predictable cycle, gradually working their way around the twenty-four hour clock as the season progressed. One could even safely plan to hold an outdoor party at night, during the part of the season when it rained in the morning. Any wonder that I questioned a local station’s weatherman about his use of the term monsoon for the nearly non-existent rains of the summer season in New Mexico? Turns out the term describes patterns of air movement which, in wet countries, produce rain and which – rarely – do the same here. The British have a wonderful word – mizzle – for the thick, misty, almost-rain conditions associated with foggy London nights. I remember walking across my college campus (Swarthmore, in Eastern Pennsylvania) in a mizzle, bundled against a wet that somehow penetrated all my layers and left me dampened and chilled. There was a beauty to the campus on those wet nights, lamplight haloed by mist showing my way through the rose garden and along winding, tree lined paths. It took several cups of hot cocoa to thaw me, when I reached the warmth of the student center. The first summer – 1990 – that I lived in my present home in Sapello, I wondered what I had done, buying a home in what felt like a flood zone. 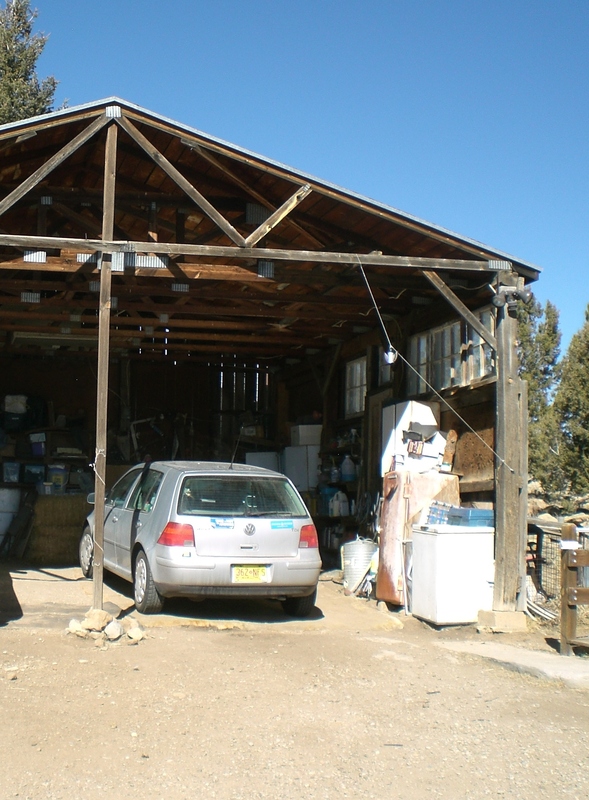 My previous residence, on eleven acres southeast of Santa Fe in the Galisteo basin, was almost 1000 feet lower in altitude, and definitely in a more desert-appearing landscape. We received the blessing of summer thunder storms during the years I lived in Galisteo. Great arcs of lightening would leap across the sky, crash into the Ortiz Mountains, and unleash water onto the prairie at a rate that could be absorbed. An occasional gully washer would plow a furrow down my drive, but was always sufficiently short-lived not to do damage. The summer of 1990 in Sapello was different. It started raining in May and seemed not to stop, not to show the sun, not to warm enough to wear lightweight summer clothing. It rained and rained and rained. My uphill neighbor’s catch pond overflowed and sheets of water poured down across my property, overflowing the culvert and – twice – washing out my driveway completely. I had to have another neighbor come in with his backhoe to rebuild the drive, installing a larger culvert in the process. My horses’ hooves softened and began to rot, as they were unable to escape standing in sopping mud. I scrambled to create a cement pad and shelter for them, before they suffered serious harm. Try laying concrete in a persistent downpour! Meteorologists tell us that the 90’s were an exceptionally wet period for this area, not a standard against which to rate our current situation. There certainly has not been a summer like 1990 in the past 15 years. I’m gently teased by a friend (native of a tropically wet climate) about my attention to our weather, to the condition of the prairie, to what I see on the distant skyline. He has yet to live through a wildfire summer. He tells me that a member of his church regularly petitions the congregation to pray for rain. Please join me in a collective focus on wetness falling from the sky onto the lands of the Southwest. In reciprocation, I will join you – if you live in the Midwest – in a collective focus on calm air and balmy days of recovery from the storms and ice of this past winter. Together, may we find a better balance and harmony in all aspects of our lives. PS: Between writing yesterday and posting tonight it rained, intermittently, for several twenty minute periods. The air is cool and damp, the ground moist and there are a few puddles glistening on the highway. I see no stars nor moon tonight – rain clouds hover overhead. Ah, the wonders of modern reliance on connectivity! I had set aside an important three hours on Friday morning, to enter client assessments into the data base system on which my job relies. Guess what? Not only could I not connect, the entire system is down. The only way I can complete any aspect of my work is by telephone – calling into the IT number from time to time, to learn whether the massive problems have been solved. With several thousand employees disbursed across the large state of New Mexico, there is no way – apparently – to alert all of us to a change in status. Disaster preparedness lessons are certainly now being scheduled. One of my duties as a Care Coordinator is to educate the clients on my caseload about disaster preparations – to help them think through where they will go if they must evacuate, what they need to have ready to take with them, how they will have their needs met in a new location, etc. The area where I live – and across which my clients are scattered – has been in severe drought for close to ten years, with this past winter being one of the driest on record. Spring is showing in town as forsythia flowering, but looking out my window I see only the dry brown of parched end-of-summer. Driving into the nearby mountains yesterday, there was no hint of green on bare branches of scrub oak, which should already be leafed out. Like most of my neighbors, I watched TV news of feet of snow being repeatedly dumped on the Midwest, and wondered why the prevailing winds could not let some of that moisture drop on us here, rather than sailing by, overhead. Surely the scientists who can put a man on the moon can figure out how to redirect moisture flows here on earth and distribute needed water more evenly! When will those individuals supposedly concerned with the nation’s welfare stop bickering about the reality of climate change in the abstract, and focus instead on solving the very real problems of weather extremes being experienced right now? These extremes are causing disasters of varying sorts, every season. That is a fact, not an abstract. Does it matter whether one believes or not that there are major, impending climate alterations for which mankind is responsible? Not at all, if the priority is to address the very real drought – and the equally real polar vortex – being experienced in different regions of our country. Stop bickering, and just fix it, already. Meanwhile, it’s an interesting experience to observe a huge non-profit brought virtually to a standstill for an entire day, because somehow its computer networks have failed. I don’t know as of this writing whether it’s the servers themselves, or access to the Internet, or some other issue that prevents us from emailing one another, or using any of our data base systems. I only know that it is obviously dangerous to build a service delivery system around an expectation that all information one needs to perform ones job can be accessed via the computer. I’ve ranted here before on the limited vision of techies who build their systems in the midst of large cities with good Net access, and who then expect those of us living in the mountains and “on the frontier” to be able to use those systems. I have to admit I’m perversely glad that serious problems have arisen today right in the center of New Mexico’s largest city. Maybe now, the voices of those of us who are frontier people will be heard! Maybe now, as well, local stores will consider making the ability to do simple arithmetic and to give change a job requirement once again. They’ve had to shut down serving customers when we’ve had power outages that turn off the cash drawer calculators. Oh, that’s right, the store’s inventory tracking is based within those calculators, and heaven forbid they make a sale that isn’t tracked. After all, doing business is about making money, not about serving customers – right? Inability to distribute food or other essential goods because the power is off, or the computer is down – now that is a recognizably man-made disaster! No need to get into the debate about man’s contribution to the current climate extremes being experienced – just look at the many local mini-disasters we most certainly cause by ignoring the fallibility of our mechanical creations. Millions of vehicles recalled, dams that crack and flood, power grids that rupture… Haven’t we collectively figured out that if it can be built, it can fail? No, I guess not. So today I don’t work as expected. Or rather, I will schedule extra clients to visit, collecting information in an old-fashioned, hand-written file folder. Whenever the technical problem is fixed, I’ll have a backlog of data to enter – as will many of my co-workers. I do hope the upsurge in computer usage doesn’t cause a new crash! Is that potential disaster being planned for, as the current repairs are undertaken? We’ll see. Meanwhile, if the present computer problem isn’t fixed before Monday, I’ll actually have a whole weekend off, for the first time since January 1. I am teaching someone to drive – again – no, I am again teaching someone to drive. There, that’s better, more accurate. The same process of correction, of attention to exact explanation is required of me as the driving teacher (not driving the student hard, but teaching the student the art of driving). And it is as much art as science. Getting the feel of the vehicle, of the wheel, of how the car wants to straighten itself out from a turn so that trying to do the straightening produces an over-correction. Learning to position oneself in the lane, noticing important warnings of the intentions of other drivers, processing what one sees and hears without needing the time to consciously think it all through. Driving, especially in traffic, requires quicker responses than conscious thought permits. I am, again, teaching someone to drive, and valuing this opportunity to become conscious of what I do instinctively. Valuing, also, this occasion to notice not just what I do right, but what I’ve gotten a bit sloppy about, and don’t want to continue to do, now that I need to be a role model of safe, defensive driving. My daily spiritual practice is essentially an exercise in shutting down thought, in order to become aware of the subtler levels of my being. Very close to what I must do to teach someone a skill at which I am so practiced that I conduct the activity beneath the level of awareness and thought. When I come out of my daily contemplation, I often bring a new insight with me, into consciousness, then do my best to put into words and actions what I’ve been gifted to perceive. Very much like the way in which I am opening to the subtle habits ingrained by so many years of driving, and attempting to give voice to them in order to instruct my student. So teaching someone to drive is a spiritual exercise! Or at least it can be, if one chooses to make use of the experience for one’s own growth in understanding. And in patience. And in trust. The vehicle being used is my ‘second’ car – the back-up GMC that serves as my guarantee of transport should my trusty and trusted and much loved VW Rabbit ever fail me. (It has not done so, as yet, in ten years and nearly 220,000 miles of mostly solitary driving). I’ve realized already that I would be far more tested were I to be giving the lessons in the Rabbit. Not just because it’s a stick shift whereas the GMC is automatic. I have virtually lived in the VW; it’s packed with all that’s necessary for me to survive through a snow storm, hunker down to wait out a dust storm, take advantage of an unexpected opportunity to camp out overnight, be appropriately dressed for sudden changes in weather, provide roadside first aid in case I come across an accident… you get the idea. My Rabbit has become far more than reliable, reasonably inexpensive transportation. It’s home away from home, an important means of connecting me to the world, a key element of my ability to earn my living and, because Rabbits remain relatively uncommon on our roads, a distinguishing mark of my presence. Not so long ago, I needed to let a mechanic drive the Rabbit so he could feel in the steering what I sensed was a developing problem. Sitting in the passenger seat as we went around the block was one of the harder things I’ve done recently. Sitting in the passenger seat of the GMC has not been difficult. I don’t have much history with the Envoy, and my student is both a quick learner and a careful driver. The challenge for both of us is that he grew up using public transportation, not riding in cars, so he still has to acquire the non-verbal, body sense of what driving a car is all about. It’s not at all the same as riding a motor cycle, which he has done. I’m also familiar with riding cycles – not driving them, but happily sitting on the back, free to enjoy the wind in my hair and the scenery flashing past with an immediacy totally lacking when one is shut inside a car or truck. I used to get the same sense of connection with my surroundings when I rode my horse out through the gate of my property and into the extensive acres of my neighbor’s ranch. A brisk canter to the far fence shut down thought and opened up my inner world. Yet another form of spiritual exercise. Perhaps I should suggest to my student that he do a short contemplation before his next turn behind the wheel? Most physical skills come more easily when one relaxes into them (think of learning to float in order to swim). Those same skills suffer when one over thinks them (tensing up in the water, and sinking). Riding behind on a motorcycle, one has to relax and let one’s body bend with the curves in concert with the driver. Up on a horse, one must become one with the rhythm of the horse’s gait. Behind the wheel of my Rabbit, I feel in tune with every nuance of the vehicle, I know that car as if it were alive. How does one teach that sort of awareness? Hearing one’s True Voice in contemplation and then living from one’s Divine Self are, like driving a car well, skills which cannot be mediated through the mind. These skills cannot, therefore, be taught. They must instead be caught by the student, who first observes them being modeled by a teacher and who then, by trial and error experience, learns to shut down the mind and respond from a wise and capable Soul. Inner commune, connection, inspiration, followed by action – the sequence of a spiritual exercise – is also the sequence many artists describe as their process of creation. Learning dance choreography many years ago, I was told by Miss Widener to stop thinking about my composition and instead to just feel my way through it. Yesterday I asked my student if he could feel how to respond to the impact of wind on the Envoy’s steering. Today I am challenged to create, with words, a feeling of intuitive understanding in my readers. Do you go there, learn, trust, respond, live from that core? Yes? Then I’m happy for you. If not, or not yet, teach someone to drive – or ride a bicycle, redecorate a room, weave a rug, or work with wood. As your student learns a new skill, you’ll gain a new level of awareness, and enjoy a new way of Being.